After global leaders conclude the annual Asia-Pacific Economic Cooperation forum in September, the purpose-built $2.3 billion conference center on a remote island off the coast of Vladivostok will become a university. They will be some of the luckiest students in the world. Those living on the Far East Federal University’s new campus will enjoy three swimming pools, artificial waterfalls, a football pitch by the Pacific and seaside accommodations that more closely resemble an upscale hotel than student digs. 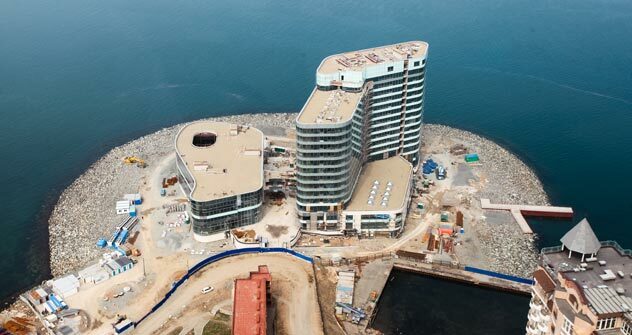 Building work on the island is just one of many huge developments receiving their finishing touches around Vladivostok prior to the APEC gathering. But critics say that the future of these prestige projects is uncertain. Beginning in the second semester of the 2012-13 academic year, 11,000 students will live permanently on Russky Island, Yaroslav Voskresensky, deputy director of Crocus International, told reporters during a recent tour of the site. About 14,000 more will be based in Vladivostok and will commute across two new bridges specially built to link the university with the Pacific Rim city. Neither bridge will be accessible to pedestrians. The developer, Crocus Group, is the government contractor for the project. “Students will live on the island in conditions that they do not enjoy anywhere else in the world,” Crocus owner Aras Agalarov said in an interview with Vedomosti last year. Like politicians, the company is confidently predicting that everything will be ready by the June 30 deadline. At the peak of the building work in 2010, 15,000 workers toiled at the site. But that number has fallen to 6,500 as the project nears completion. The summit, which will be attended by the leaders of APEC member countries, begins Sept. 2 and runs for a week. Usually held in November, it was moved forward by two months during Russia’s host year because of Vladivostok’s harsh climate. The seas around Russky Island are frozen for six months over winter, and there is a notoriously bitter wind. The 2011 event, organized by the United States, was held in Hawaii. The cost of the conference center was 75 billion rubles ($2.3 billion), Voskresensky told reporters last week. That is 17.8 billion rubles more than the price tag Agalarov named in May 2011. Money for future upkeep of the university will come from the federal budget and rental revenue from some of the buildings, Voskresensky added. But experts suggest that after showpiece events, big infrastructure projects can be hard to finance and manage. The legacy of the university on Russky Island is “incomprehensible,” said Alexander Kynev, an analyst for regional politics with the Foundation for Information Policy Development. And long-term viability was clearly also on the mind of First Deputy Prime Minister Igor Shuvalov when he inspected the area in February. He suggested that work should be found for students in shops, kiosks and other parts of the university during their studies. Before the building of the 1 million square meters of living and work space, Russky Island was inhabited only by a shrinking population serving the long-standing military base. The deaths of naval personnel from starvation on the island in the 1990s became a national scandal. Its isolation meant that all the necessary materials for construction had to be brought by ferry, including fresh water and 400 tons of dynamite. With the completion of two massive road bridges at a cost of about 54 billion rubles also scheduled for June 30, however, the island will be comprehensively linked to Vladivostok. The larger of the two bridges, connecting Russky Island and the mainland across the Eastern Bosporus Strait, was described last year by then-Prime Minister Vladimir Putin as “one of the new symbols of Russia.” At 1,104 meters long, it is among the longest cable-stayed bridges in the world. A smaller bridge will link two parts of Vladivostok across Golden Horn Bay. Unlike its bigger brother, that bridge has support pillars that diverge from one another as they reach upward, prompting local residents to make unflattering comparisons with a woman’s splayed legs. Workers were painting the bridge Thursday, and large amounts of scaffolding were still in place. Tarmac was being laid on the bridges this week, RIA-Novosti reported. Other big infrastructure projects tied to the APEC summit and Moscow’s development program for the Far East include a gas pipeline linking Sakhalin, Khabarovsk and Vladivostok, a new airport, road upgrades and hotel building. Then-President Dmitry Medvedev warned in June 2011 against a last-minute scramble to finish on time. But company executives in Vladivostok were sanguine about the imminent deadline. Everything will be ready, said Viktor Sklarov, deputy director of Pacific Ocean Bridge Building, which is responsible for the smaller of the two bridges. The work going on at the moment was the equivalent of “polishing your shoes,” he said.